The Tusbeeh Khana or Oratory is situated to the south of the Hall of Audience and immediately connected with the Female Apartments. It is now commonly used for the more private Durbars or Levees, but originally, from the scales and the sword blades, the emblems of justice, it was evidently appropriated to purposes of higher import. These symbols are by no means of oriental character and they consequently confirm the belief that the Royal Palaces at Dehly and Agra were designed and superintended by European architects. 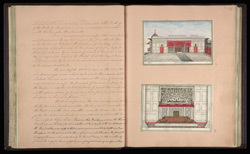 The small gilt wicket, seen in the 2nd of the two drawings and which represents the interior of the Tusbeeh Khana, was constructed in the days of anarchy and distrust and for the purpose of communication to the Emperor any secret intelligence of great moments and at the same time of protecting him from any sudden surprize on his own person. The seat in front is the one now in use, but the pillows are sadly executed. The long round one supports the back and the two smaller ones, the knees. His Majesty, be it remembered, is accustomed to sit with his legs crossed before him. It was in this building and on this throne that his present Majesty was installed at midnight of the 23rd September 1837. The guard of honor on duty on that occasion was commanded by Captain, now Major Thompson C.B. the distinguished Officer of Engineers, who blew open the gate of the Fortress of Ghuznee when attacked by the British Army in 1839, and thereby paved the way for the successful issue of our first campaign in Afganistan. Inscribed: naqsha-i ‘aqab-i tasbih khana dar divan-i khass. ‘amal-i Mazhar ‘Ali Khan. Inscribed: naqsha-i andarun-i tasbih khana … divan-i khass. ‘amal-i Mazhar ‘Ali Khan.